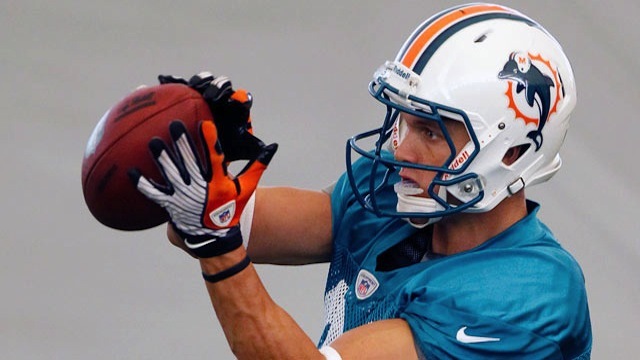 With final cuts completed and many players having cleared waivers yesterday, the Miami Dolphins have formed their initial practice squad for the 2012 season. Signed to the practice squad already are wide receivers Jeff Fuller and Chris Hogan; guard Chandler Burden; offensive tackle Andrew McDonald; linebackers Josh Kaddu and Jonathan Freeny; cornerback De'Andre Presley; and safety Anderson Russell. Of the eight players, seven attended training camp with with the Dolphins. Burden, Fuller, Hogan McDonald and Russell were waived Friday during final cuts, while Freeny and Faddu were let go Saturday after the team added four on waiver claims. The lone newcomer is Presley, who is a college quarterback from Appalachian State that went undrafted in 2012 and converted to corner while attending camp with the San Diego Chargers. He was waived Friday during final cuts as well. As a reminder, players signed to the practice squad must be free agents when they sign, i.e. no "moving" players from the active roster to the practice squad. Players can sign new deals to move to the 53-man roster at any time. Practice squad players can also negotiate and sign to other teams' 53-man rosters, although those teams must keep them on the active roster for at least three weeks. A defensive lineman that converted to offensive tackle at Kentucky, Burden went undrafted in 2012 and signed with the Titans. After being released prior to training camp, Burden signed with the Dolphins on Aug. 1 when the team waived lineman Dustin Waldron. Burden has worked at left guard for his entire stint with the Dolphins, elevating to the second team when veteran Eric Steinbach retired a few weeks back. His upside is unclear, with his purpose right now to serve as Richie Incognito's backup during practice. An undrafted free agent out of Rutgers in 2011, Freeny signed with the Dolphins but was waived before the regular season. He was out of the NFL entirely and even signed a deal with the AFL's Chicago Rush before joining the Dolphins' practice squad last December. Freeny re-signed with the Dolphins in the 2012 offseason and remained at outside linebacker in the team's new 4-3 scheme, despite being a pass-rushing defensive end in college. (He had 9.5 sacks as a junior.) Freeny survived final cuts on Friday after a strong preseason, ranking third on the team with 12 tackles. Although Freeny takes a steep pay cut with the move to the practice squad, he had a solid preseason and is probably liked by the team well enough. Depending on how impressed the team is with waiver pickup Sam Brown, Freeny could be back on the active roster at some point this season. In the mean time, he'll split time with Brown as a backup strong-side linebacker. Fuller had a productive career as a receiver at Texas A&M, but his struggled with drops and subsequently went undrafted. Although he caught seven passes for 55 yards in the preseason, he had his share of drops then as well and ultimately proved unready for the big stage at this time. As a guy with a nice frame at 6-foot-4 and 223 pounds, some upside and a history with quarterback Ryan Tannehill and offensive coordinator Mike Sherman at A&M, Fuller is certainly worth an extended look and has the chance for a midseason call-up. A former lacrosse player at Penn State that played a season of football at FCS Monmouth, Hogan signed to the Dolphins' practice squad late last season and was re-signed in the offseason. He caught four passes for 34 yards this preseason, gaining nationwide notoriety on HBO's Hard Knocks after Reggie Bush dubbed him "7-Eleven" because he's always open. The fact that Hogan was the lone receiver on the team that didn't see significant preseason action shows the Hard Knocks coverage was fairly misleading. And the fact that Hogan passed through waivers and was re-signed to the Dolphins' practice squad shows he's probably not the next Wes Welker. Regardless, he's a try-hard guy that's honing his craft and is worth keeping around for now. The Dolphins' fifth-round pick in 2011, Kaddu was a question mark as far as making the team because he's extremely raw and had an up-and-down preseason. In the end he'll start on the practice squad, where he'll work as a backup weak-side linebacker in practice. He could earn a promotion at some point as a rookie of the Dolphins want to protect him from leaving. McDonald is an interesting case because he was signed nearly two weeks after the rest of the undrafted free agents signed by the Dolphins. The Indiana alum impressed in camp and earned the backup right tackle job over Will Baker, making him an obvious keep here. I don't know if he's particularly close to a promotion, but he'll work as Jonathan Martin's backup in practice for now. The 5-foot-11, 180-pound Presley was a dynamic playmaker at Appalachian State, working at quarterback, wide receiver and defensive back. He served as the Mountaineers' starting quarterback as a junior, throwing for 2,631 yards and 21 touchdowns against seven interceptions while rushing for another 1,039 yards and 13 touchdowns. Presley never had a chance of staying at quarterback in the pros and worked at cornerback with the Chargers in the preseason after going undrafted in 2012. He'll continue to hone his craft on the Dolphins' practice squad for now, although he's a pretty big project. Undrafted out of Ohio State in 2010, Russell played in two games with the Redskins as a rookie. He spent the entire 2011 season on the Dolphins' practice squad before being re-signed in the offseason. Russell tied for the Dolphins' preseason lead with 14 tackles but was waived during final cuts. He has some special teams value which will help him earn a call-up during the season, though for now he'll work as a backup safety in practice.